I will be AGU next week (Tuesday through Thursday morning). 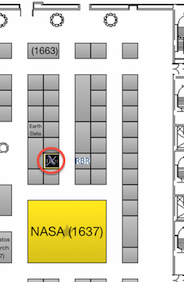 I’ll be hanging out at the Tech-X booth (circled at right, just up from the NASA booth) most of the time, but will also be patrolling the posters and hitting a few talks as well. Tech-X Corporation invites you to visit our booth (Booth #1748) at the American Geophysical Union Fall Meeting 2011, December 5 – 9, at the Moscone Center in San Francisco. We will be featuring GPU Computing, including GPULib, our library of mathematical kernels for GPU computing. We will also be demonstrating the Remote Data Toolkit, which allows seamless access to remote data with IDL. Exelis VIS will be at booth #1431; I haven’t heard about if there will be an IDL user group meeting. UPDATE: Also, if you have an iPhone, I recommend the AGU app. It has been very useful already for me. Full disclosure: I work for Tech-X Corporation. Unfortunately, VIS will not host an IDL user group meeting this year. You said you weren’t going to AGU this year, but I still had hope that there would be something.